Jackson Hole is home to one of the most exiting activities in the world. Many people come every year to experience the thrill of rafting in these rapids and the thrill of camping outdoors under the stars. White Water Rafting has quickly become a summer activity favorite. Rafting trips vary a great deal from the calm, scenic upper Snake River which offers a unique perspective of Grand Teton National Park. The Lower Snake River offers more challenging rafting with wild rapids and lots of frothy waves along this portion of the river. 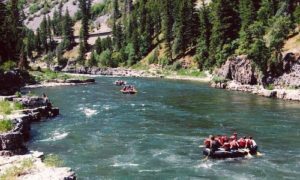 Regardless of your age and abilities, there is a rafting trip suitable for your requirements along the Snake river. Customers who are perhaps a bit older or cannot swim can take some of the more sedate rafting trips with waves less than 2 feet high. These rapids offer great views and some thrills, however they are not sufficiently high enough that there is danger of capsizing or being ejected from the raft. Always make sure you wear your life-preserver and follow the instructions of the guides. The lower Snake River route runs the whitewater of the Snake River Canyon. Experience Big Kahuna and other fun rapids around the area. It’s Jackson’s most popular trip for good reason! Jackson Hole lies just west of the Continental Divide and occupies about 400 square miles. The waters of the Snake River take up part of the valley, making for an impressive view and fantastic whitewater rafting opportunities. The Jackson Hole Whitewater offers Whitewater and Scenic Rafting Trips on the Snake River. It provides 8 miles of wildest adventurous whitewater trip in Jackson Hole. Float for 13 miles past some of the most beautiful scenery in Jackson Hole, the entire trip takes about 7 hours and many outfitters will include lunch on the river. Take Water River Trips through 8 miles of whitewater in the Grand Canyon of the Snake River. Combining spectacular scenery with the excitement of rolling rapids, this trip has all the ingredients for the perfect river adventure. The small 8-man paddle rafts are available on the whitewater section starting in June. There are many whitewater rafting outfitters in the Jackson Hole area. You can find many on the internet, however we suggest that really word of mouth and referrals is always the best way to go. Going on a class 1 or 2 set of rapids, is not dangerous with only 2 foot waves, however higher class rapids require more skilled guides that are experienced in handling groups in more aggressive whitewater rapids. An overnight trip along some of these rapids can be an unforgettable experience. And with the right company who provides all of the things you need to make your trip enjoyable, you will not only have fun, you will experience the camaraderie of camping under the stars around a camp fire and enjoying meals cooked in the outdoors. Check with your local rafting company to determine exactly what they offer to their customers. Select the trip that makes the most sense to you based on services offered and the overall safety of the trip vs. your abilities for paddling and swimming. They will explain in detail what you will receive and if you are unsure, just ask more questions. How many people will there be in the raft? What class of rapids will we be going through? Do we need to paddle a lot or just when the guide needs us to paddle? Will we get wet, will we capsize? Do we wear life preservers? If we are getting lunch, what is included? What clothes should we wear and how do we get dry clothes at the end? Should we leave valuables behind such as jewelry, watches, wallets, glasses? What are the physical requirements for the trip you are going on? How do we get back to our starting point? Can kids or elderly people go on this trip?